Kevin Burke is a District Judge in Hennepin County, Minnesota. He is one of the most recognized leaders within the American judiciary. Judge Burke was elected for four terms as Chief Judge and three terms as Assistant Chief Judge. During this time he instituted social science studies – and reforms improving – procedural fairness. From 1991 – 1996 he served as the Chair of the Conference of Chief Judges. He chaired the State Board of Public Defense, and was a leader in the effort to improve and expand the state's public defender system. Judge Burke has been named one of the 100 most influential lawyers in the history of Minnesota by Law & Politics magazine. In 1996 he was named a Toll Fellow. The Toll Fellowship identifies emerging state leaders from all three branches of government. In 1997 he received the Director's Community Leadership Award from the Federal Bureau of Investigation. In 2002 the National Center for State Courts awarded him the Distinguished Service Award. In 2003 he was selected as the William H. Rehnquist Award recipient by the National Center for State Courts. The Rehnquist Award is presented annually to a state judge who exemplifies the highest level of judicial excellence, integrity, fairness and professional ethics. He was awarded Public Official of the Year by Governing Magazine in 2004. In 2005 the Minnesota Chapter of the American Board of Trial Advocates named him Trial Judge of the Year. The American Bar Association named him Judicial Educator of the year in 2010. 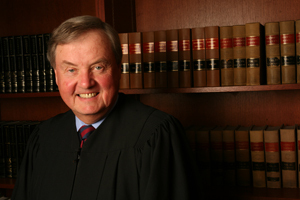 Judge Burke teaches at the University of Minnesota and University of St. Thomas law schools. For many years he served on the faculty of the University of Minnesota Humphrey Institute's Reflective Leadership Program. He has been a speaker in 40 states as well as Abu Dhabi, Australia, Canada, Egypt, Mexico, China, India, Kosovo and Ireland regarding improvement in judicial administration and court leadership. Judge Burke has authored numerous articles, and is the co-author of two American Judges Association White Papers, "Procedural Fairness: A Key Ingredient in Public Satisfaction" and "Minding the Court: Enhancing the Decision-Making Process." He presently serves on the Board of the Institute for the Reform of the American Legal System and the National Association of Court Managers. He is a past Board member of the National Center for State Courts and the American Judicature Society.